Clarksville, TN – Austin Peay State University (APSU) women’s basketball team gained a little bit revenge over SIU Edwardsville, defeating them in wire-to-wire fashion, 77-65, Thursday night, at the Dunn Center. The Governors (11-11, 6-5 OVC) allowed just 16 points in the first half, leading by double-digits for most of the game and thwarted off any comebacks from the Cougars (10-12, 5-6 OVC). Offense was extremely hard to come by in the opening minutes, with the two teams combining to miss the first nine attempts from the field. However, a Keisha Gregory three-pointer sparked a Govs’ explosion, hitting their next five shots, including two more threes from Gabby Gregory and Maggie Knowles. The Govs held the Cougars scoreless over the last three minutes of the period and led 15-8 after the quarter. The eight points allowed were also tied for the least allowed in the first quarter by the Govs this season. Brianah Ferby started off the second quarter strong for the Govs, nailing a triple on the first Govs possession. In a blink of an eye, the Govs extended their lead to 15 with Gabby’s second three-pointer of the game, as the Govs embarked on a 7-0 run. SIUE could not get anything going against a stifling Govs defense. The Cougars did not make a three in the first half and shot only 30 percent in the half. Nieja Crawford had herself a great quarter, slicing in the lane and finishing through contact and then dropping in a three-pointer of her own to give the Govs an 18 point lead late in the half. 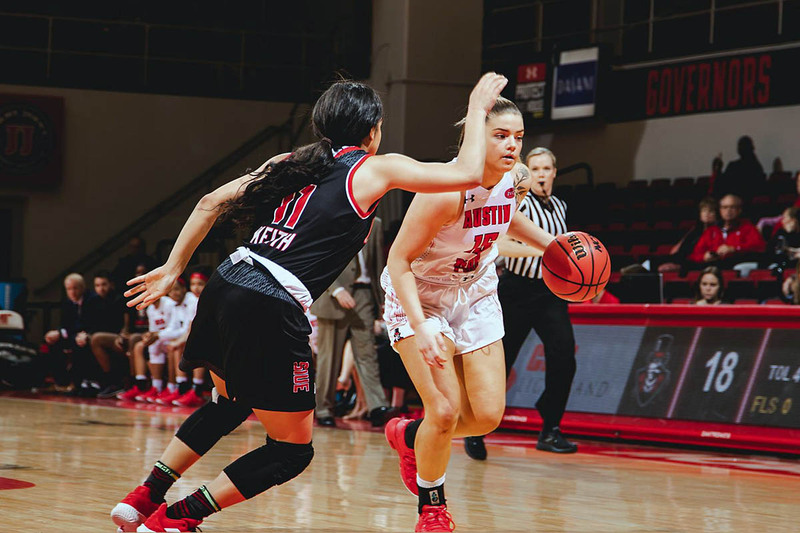 The Govs completed a great half when Arielle Gonzalez-Varner caught a rebound while fading away and threw the ball back over her head towards the basket in one swift motion, just beating the buzzer as APSU led 33-16 after one half of play. Gonzalez-Varner led all scorers with rebounders with eight and eight as the Govs made it a clear point to crash the glass. The Govs had 16 rebounds in the first half, which is not a huge number by any means, but outrebounded the Cougars 16-14 after grabbing just 19 rebounds the entire game in the first meeting at SIUE. The 16 points allowed in the first half was also the second least the Govs have allowed in a half this season. The Cougars may not shoot the ball in a lights out fashion, but there was not a chance they were scoring just 16 points in a half again. Nakiah Bell hit SIUE’s first three-pointer early in the third before Bell and Christen King made back-to-back triples to cut the Govs’ lead to 12. The Cougars were getting more open looks to start the half and made them count, starting five-of-five from the field, three-of-three from three-point range, and three-of-three from the free-throw line. SIUE primarily used two 6-0 runs in the quarter to cut the lead to just eight, but the Govs weathered the storm and remained composed. A Gonzalez-Varner bucket gave her a double-double and then Michaela Campbell drained a corner three-ball to put the Govs back up 13. SIUE dominated the glass in the third period, but perfect ball movement led to a Brandi Ferby three-pointer with just two seconds to go, as the Govs led by 12 going into the fourth. Ferby and Keisha both hit threes early in the fourth quarter to put the Govs up by as many as 15, with the 10 made three-pointers their most in a game since the OVC opener against Eastern Kentucky. The Cougars kept fighting, being extremely aggressive on their way to the basket, but the Govs kept getting to the line and halting the SIUE momentum. SIUE cut it to nine multiple times in the period, but the Govs took care of business after a dominant first half to win by a score of 77-65. With the win, the Govs improve to 6-5 in the OVC and return home to face off against Eastern Illinois on Saturday. Arielle Gonzalez-Varner finished with a double-double (13 points, 14 rebounds). The Govs had just 11 turnovers, their second fewest in OVC play this season. The Govs made 10 three-pointers, their most since the OVC opener against Eastern Kentucky. The 16 points allowed in the first half was the second fewest amount of points allowed in a half this season. The Govs had their second best three-point percentage on the year, finishing 10-of-23 (43.5 percent). The Govs recorded their third wire-to-wire win this season. The Govs snapped a five-game losing streak to the Cougars. The Govs are now 6-5 in OVC play.